Arnaud Fradin is the guitarist from soul, funk and R&B sensations Milk & Green - or Malted Milk & Toni Green, to give them their full title. Arnaud was born in France, his interest in music, and blues in particular, being established at the age of 15 when a friend gave him a Lightnin' Hopkins album. From there, he moved on to the songs of Bob Dylan, discovering the guitar along the way. It wasn't long before he began experimenting with slide playing, too. "I started to play in a little acoustic blues band in Nantes, my hometown. I didn't know so much, but it was cool because it was a really good way to learn to play in front of people." After a while, Arnaud discovered the playing of Robert Johnson, which was to go on to form the foundation of his music career, as well as being the reason why his band is called Malted Milk. Playing at France's Cognac Blues Passions festival at the age of 20 allowed him to learn from the older players performing there. Pretty soon, he was playing at every festival he could find, meeting up with people who shared his passion for the blues. "At this time, we were more into the blues than we are right now. We play soul, funk and blues, but I've still got my roots. I always try to keep a little of the blues in everything I do." Milk & Green have attracted five-star reviews from the music press, praising their intoxicating blend of genres. Arnaud's guitar sings atop the band's upbeat repertoire and complements the powerful soul vibe provided by vocalist Toni Green. Despite all this, he's quite happy to go back to basics when he comes off the road. "I come back from Malted Milk tours - nine guys on the road, horn section and everything - and I'm really happy just to play my guitar and a harp. "Right now, I'm thinking about doing an acoustic CD - you know, really deep roots blues. I feel I'm ready." 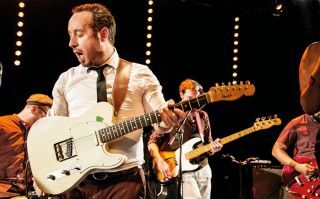 If you like your music both soulful and funky, then it's quite likely you'll take to Milk & Green immediately, Arnaud making sure that his band never strays too far from its blues roots. In fact, future Milk & Green releases are likely to move even closer to enveloping his love for Dylan's music, too… "We recorded a video with Toni in the studio playing an acoustic version of It Ain't Me Babe with slide guitar, and the ambience is really blues. "It's kind of different compared to what we did on the last CD, but it's important for me to keep that roots thing in my music." Arnaud is a self-confessed geek when it comes to gear. His acoustic guitar was made for him by French luthier Cyril Guérin in 1999 and resembles a small Martin guitar, Arnaud adding that its sound is really open and perfect for blues playing. He has a Dobro and a Recording King, too, to bolster his armoury of acoustic instruments. After playing a Gibson 335 on stage for 10 years, he's now switched to a T-style guitar made by Haar Guitars. As far as amps are concerned, he uses Fender amps - a Deluxe Reverb or a Twin - or a Custom Barber… "I can use the [Barber] amp without any pedals. The crunch is really natural; it's not as aggressive as a Fender. You can have more midrange, so it helps me not to play too loud on stage." The recently released album from Milk & Green is a good place to begin exploring Arnaud's subtle brand of blues and funk - and, of course, as always, You Tube will reveal some official live videos of the band in action. But you really need to see the band live!